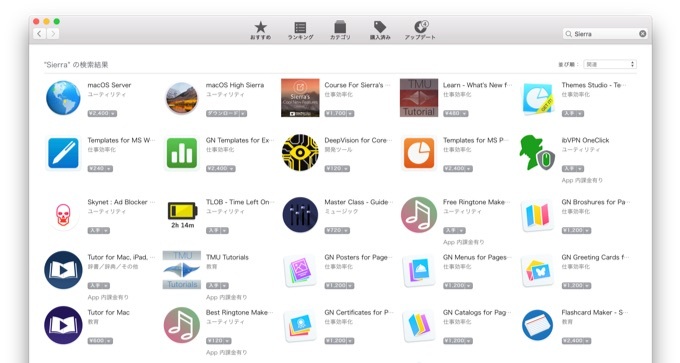 macOS 10.12 Sierra以後のmacOSは購入済でもMac App Storeの「購入済み」タブには表示されない状態に。 | AAPL Ch. “macOS Sierra or later doesn’t appear in the Purchased tab,” reads the document. In the case of macOS Sierra, the change means that there’s no way for Mac users to download macOS Sierra should they want to downgrade from High Sierra for some reason. To reinstall Safari, Mail, the App Store, or other apps that are included with the Mac operating system, reinstall macOS. macOS Sierra or later doesn’t appear in the Purchased tab. Instead, use the Search field in the upper-right corner to find and open the App Store page for that macOS.